Why would you choose for an internship or volunteer experience with Local Dreamers? So many new organizations have joined the field of volunteer work in the 21st century, that this field has become a real business. In the name of Voluntourism, the focus of a lot of organizations has shifted towards making a profit out of their volunteers, instead of contributing to real local needs. Local Dreamers fully thrives on the effort and dedication of its enthusiastic volunteers and does not offer paid contracts to anyone. In this way, we make sure that passion and ideals remain the foundation of our work. Valuable contribution. 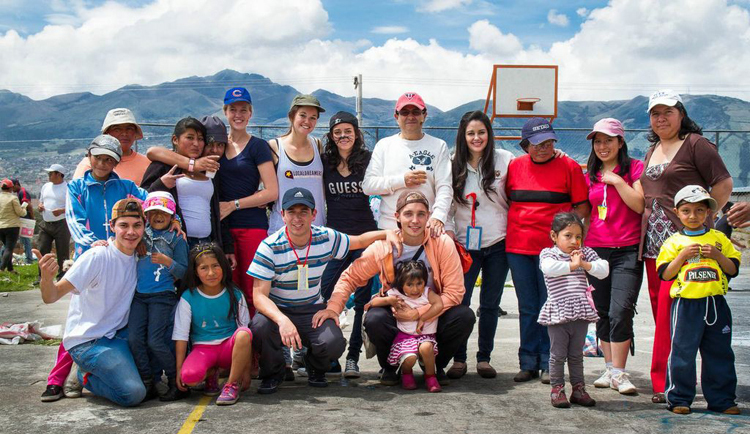 Local Dreamers is closely involved with local Ecuadorian organizations whose projects have been extensively tested. LD continuously remains in touch with the partner organizations in order to be up to date with the local needs for the projects. In this way you will be able to make a meaningful contribution to the local community. Valuable contribution (2). Before each new project a thorough need assessment is executed. We analyze what schools, parents, children and the community need and adapt to those needs. Involved. LD is directly involved with its (local) projects. There is always someone nearby to guide the volunteers. In this way, the partner organizations can pay their full attention on the fulfillment of their projects. Guidance. At LD, we are deeply attached to the preparation and personal guidance of our volunteers. There is always a listening ear and a helping hand before, during and after your adventure in Ecuador. We strive for growth, but at the same time try to keep the feeling of a ´small´ organization. Accessible. Not a single volunteer or intern will be a puppet of the organization. LD is young, dynamic and accessible. We are open and will ask you for your input to improve our organization and projects. We strongly encourage you to come forward with your own initiatives. Safe and available. In a country like Ecuador, it is pleasant to have support when something goes wrong. Local Dreamers has an enhanced emergency plan for those occasions and is always available to you, both at home as in Ecuador. Focused deployment of knowledge. Volunteers do best what they have been educated in. We think it is important to match the qualities of our volunteers with the right activities. Somebody that works well in theater, works in a theater group. Somebody with a pedagogical background is in front of the class. Don´t expect to build a school from scratch as a biology student (unless that is what you want of course). LD is not active in fields on which no internal knowledge is available. Honest. LD does not place advertisements in which poverty is being exploited. We don´t talk about ´poor people´, not about people that are less happy than we are, and not about people that need our help. Although there are enough people in Ecuador that live in circumstances that for an average Westerner are regarded as miserable, we will try to change your way of thinking on it. Somebody that does not has warm water or a computer at its disposal, does not have to be less happy than we are. Transparency. Local Dreamers is explicit about what happens to your money. Money for development aid often falls into the wrong hands. Therefore you may expect transparency from our side. Passion, not a business. Local Dreamers fully thrives on its volunteers and does not have any contract workers. In this way we want to let our work be a passion, and not let it become a for-profit business.